Joseph of Arimathea met the Roman prefect and requested him for the body of Jesus as the burial had to be completed in a hurry as the next day was the Sabbath. Jesus was entombed in the burial cave of Joseph of Arimathea. Mary mother of Jesus was not present during the burial. Was There A Conspiracy In The Burial Of Jesus? Eight years of research may seem rather protracted even if the subjects are as complex as the tomb of Jesus, the ossuary of James and the role of Mary Magdalene in the early Church and her relationship to Jesus. But eight years is not really all that long when you consider that the study is about events that happened 2000 years ago, when the available literature is not ample and whatever is available is riddled with controversies and contradictions. With the available information and reasonable conjectures the task at hand is to try and resolve the many puzzles and reconstruct what in all likelihood happened. We have seen what the early and subsequent Christian writers had to say about the significant aspects of the life and death of Jesus, about James the Just and the role of Mary Magdalene. After the crucifixion of Jesus, there was a scramble for the leadership of his movement. Many of the contenders wrote their own gospels. This is the reason why there was a time when more than twenty gospels were in existence. A few of the authors claimed that the resurrected Jesus appeared to them and their authority to teach his word was received directly from him. And to add credibility to what they preached, they sometimes tailored events relating to Jesus to suit their teachings and the audience for which they were meant. At times they did this by altering some of the events in Jesus’ life to make them appear as fulfillment of Old Testament prophecies. To those who would not accept Jesus as God, they made him a messiah. For those who were oppressed and longed for divine deliverance they made him god. We have crucifixion narratives from people who were not even witnesses to the event. We have accounts of the resurrection from people who went into hiding fearing for their own lives. As a consequence, there are different versions of these two seminal events. Mark’s narration of the crucifixion, which was probably the first, involves “a kind of crucifixion drama … compiled to meet the religious needs of a Gentile Church” (1). As for the resurrection narratives, the versions are even more diverse. There are different claims as to who the resurrected Jesus first appeared. We are also not sure whether he appeared to the apostles in Galilee or in Jerusalem. There are varying reports that he appeared as a spirit and then there are claims that he appeared in flesh and blood (2). The form of Christianity advocated by James was not a new religion, but “a Jewish messianic movement centered on Jesus”. On the other hand Paul “pushed Christianity in an increasingly Gentile direction as the first century progressed” (3). Paul molded a Christianity that had greater appeal and eventually prevailed as the dominant religion. In time Jamesian Christianity was sidelined and much of the other literature was branded as heresy. The fact that Paul wrote about 40% of the New Testament is further proof that “victors write history”. We know that Joseph of Arimathea and Nicodemus took down Jesus from the cross with the help of the centurion Abenadar. While Joseph of Arimathea and Nicodemus held the upper body of Jesus the centurion took upon himself the responsibility of drawing out the huge nails that were driven through the palms and feet of Jesus. After Jesus was brought down the centurion trudged off towards Pilot’s house and the two middle-aged men carried Jesus to the well in Joseph of Arimathea’s garden that lay just beyond the city walls quite close to Golgotha. The two benevolent gentlemen propped up Jesus against the wall of the well and began to wash off the blood in accordance with the Jewish custom (4). Joseph of Arimathea and Nicodemus then applied myrrh and aloes on Jesus. When they were about it, Jesus began to show signs of life. Were the two men shocked? Far from it! The two had indeed expected just this. While myrrh and aloes are also used as perfumes, in this instance they were used for their medicinal properties to revive Jesus who was in a state of coma. All indications are that Joseph of Arimathea had made a deal with Pilate. When Jesus was brought before the Sanhedrin not all members agreed that Jesus had committed blasphemy and deserved to die. For instance Joseph of Arimathea and Nicodemus argued with the other members of the Sanhedrin that Jesus had done no wrong. Joseph of Arimathea knew that somehow the other members of the Sanhedrin would force Pilate to decree the death penalty for Jesus. He was sure that Pilate dared not go against the committee as the Jewish leaders had threatened to report him to Caesar if he refused to crucify Jesus. So Joseph of Arimathea decided to approach Pilate with a proposal. It was common knowledge that Pilate was a corrupt procurator. And Joseph of Arimathea being a wealthy merchant offered Pilate a hefty bribe to decree that Jesus be crucified on the day of preparation. This would mean that Jesus would be on the cross for only a few hours. Pilate must have known that Jesus would be drugged and taken down from the cross while he appeared dead. According to John (John 19:28) Jesus said “I am thirsty”. In response he was given a sponge soaked in vinegar/ soured wine. The Romans were cruel beyond an extent. They are said to do this to revive the victim so that he is conscious to feel pain. But in the case of Jesus it seemed to have had the exact opposite reaction. After receiving the sour wine Jesus said “It is finished,” and then he bowed his head and lost consciousness. This is probably because that the vinegar was not just vinegar. It was in all likelihood laced with a drug that caused Jesus to appear dead. Belladonna and soporific drugs were common in the Middle East at that time. Some scholars have suggested the involvement of the Essenes who were the followers of Jesus (5). While it took many hours and in some cases a couple of days for victims of crucifixion to die, Jesus was declared dead after being on the cross for just three hours. From the sequence of events before and during the crucifixion it would appear that there was a conspiracy to make sure that Jesus was not put to death. After he was convinced that Jesus appeared dead to the handful of onlookers, Joseph of Arimathea approached Pilate for permission to take down Jesus from the cross. We are told that at first on hearing Joseph of Arimathea’s request, Pilate is surprised that the request should have come so soon. He carried on the charade by sending a centurion to verify that Jesus was no more. In those days the checks to verify that a person was dead were not as refined as they are today. So probably the centurion decided that Jesus was dead after a visual inspection. Another factor to consider is that the Jewish leaders went to Pilate and asked that the legs of Jesus be broken. While the legs of the victims on either side of Jesus were shattered, Jesus’ legs were not broken. Roman soldiers were generally known for their cruelty. They sometimes crucified victims in different positions merely for their amusement. It is difficult to believe that they were either compassionate and therefore did not smash the legs of Jesus or that they did not do so because they were convinced that Jesus was dead from a cursory glance at the body on the cross. We are also told that one of the soldiers pierced Jesus’ side. And when he saw a mixture of water and blood ooze out he was convinced that Jesus was dead. According to some sources it was not “water and blood” but just blood. Besides who knows for certain one way or the other? After all there were no apostles who witnessed the crucifixion. As per the Gospels “they all forsook him and fled” (Mark 14:50). According to apocryphal writings – The Gospel of Nicodemus (The Acts of Pilate) – the name of the soldier who pierced the side of Jesus was “Longinus”. Legend has it that this soldier was partially blind. Of all the soldiers available, why would a partially blind soldier be chosen to deliver the coup de grace and why would he pierce the side of Jesus and not aim for the heart? All indications are that there was a conspiracy between Joseph of Arimathea and Pilate to make sure that Jesus did not die as a result of the crucifixion. For whatever reason, there is no doubt that Pilate played the central role in making sure of this. If Pilate did not help to ensure that Jesus was not killed on the cross, why would the calendars of the Saints of the Coptic Church, both in Egypt and in Ethiopia, depict Pilate and his wife as “saints” (6)? After they had washed him, they carried Jesus inside Joseph of Arimathea’s house and left him there in the care of the Essenes. The two then prepared what looked like a body wrapped in burial linen known in Hebrew as a takrik and in the rabbinic sources as a sadin using the 75 lbs of spices that Nicodemus had brought and whatever else they could use. They then carried what looked like a body in burial linen to the tomb of Joseph of Arimathea as already arranged. At the site of the tomb were Mary Magdalene and Mary the mother of Joses. Joseph of Arimathea who was the initiator of the plot knew that sooner or later there would be trouble from the Jewish elders. Because of this he asked the beloved disciple John to take Mary the mother of Jesus and go to Ephesus a place that was familiar to Joseph of Arimathea because of his frequent business trips to England. It is likely that he stopped over on his to and fro trips and had friends there. This is the reason why both Mary the mother of Jesus and John were absent during the entombment and other than the two men and two women, there were no relatives or followers of Jesus at the burial site. We know from Matthew 27:57 “evening having come, a rich man from Arimathea coming up to Pilate, requests the body of Yeshua”. We also know from elsewhere in the Bible Mark 15:42 that “Now evening occurring” has been interpreted as “when the sun sets”. So by the time Joseph of Arimathea approached Pilate it was already after sunset. And by the time Joseph of Arimathea and Nicodemus carried Jesus to Arimathea’s garden and then prepared what appeared to be his body, it must definitely have been past sunset. When Joseph of Arimathea and Nicodemus reached the tomb with what appeared to be the body of Jesus it was almost dark – presumably that part of the day when it was dark, but not dark enough to light a lamp. In addition to the two women – Mary Magdalene and Mary the mother of Joses – there were only a few Jewish guards there. The soldiers sat to a side indifferent to the burial rituals and the women stood at a distance still too distraught with the events of the day. Joseph of Arimathea and Nicodemus carried the burial linen with its contents to the tomb’s interior. There they placed the bundle on the bench along one of the walls, opened it, spread the spices on the loculus, folded the linen and kept it to one side and emerged from the tomb to the relief of the women who waited outside. That done the women proceeded to their homes. Joseph of Arimathea and Nicodemus blocked the entrance to the tomb with a golal, bid the guards goodnight and left in the direction of Joseph of Arimathea’s house that was just a short distance away. This is the only plausible explanation for the empty tomb: the body of Jesus was never interred there. There is no question of the apostles robbing the body of Jesus. They would not dare attempt any such bravado, too frightened for their own lives. As for the bodily resurrection of Jesus being an explanation for the empty tomb, there are no witnesses to the phenomenon and there are too many contradictions to lend credence to the claim. Could Joseph of Arimathea have executed this plot with only the connivance of Pilate and the help of his middle-aged friend Nicodemus? Seems unlikely! It is quite probable that he had the help of the followers of Jesus and James. If this is so, then we must try and figure out if Jesus and James were Essenes and what Jesus meant to the sect. (3) Shanks, Hershel & Witherington iii, Ben. (2009). The Brother of Jesus. Harper- Collins ebooks. New York. Pg. 114. (4) Gibson, Shimon. (2009). The Final Days of Jesus. The Archaeological Evidence. HarperCollins Publishers Inc. New York. (6) Ata ur-Rahim, Muhammad. (1996). Jesus: Prophet of Islam. Tahrike Tarsile Qur’an pg. 37. Is The Garden Tomb The Tomb Of Jesus? The burial cave that subsequently came to be known as “The Garden Tomb” was accidentally uncovered by a peasant who wanted to cultivate the area and was trying to cut a cistern into the rock. Soon after Conrad Schick, who was the Jerusalem correspondent for many erudite European societies visited the cave. Many archaeologists of renown who studied the Garden Tomb have declared that it is typically a first century Jewish tomb belonging to a rich person. Like other Jewish tombs of the period this too is oriented toward the Temple Mount. Like the tombs of that time which it resembled in form, it had an outer “weeping chamber” and an inner chamber with burial niches for the dead. The type of chiseling both inside and outside was the same as the other Jerusalem tombs of the period between the second century B.C. and the first century A.D. Besides the tomb conforms to “a sepulchre that was hewn in stone, wherein never man before was laid” (Luke 23:53.) as described in the Bible. It has a nephesh (“soul”) which is “a window-like cut in the upper right-hand face”. According to Jewish tradition, it is through this window that the spirit of the deceased departs after being in the tomb for three days. Of the three burial niches inside the tomb, only one was complete. This is an indication that the tomb was new as is stated in the Bible. Scholars have tried to show that the Garden Tomb is the tomb of Jesus by saying that “Gordon’s Calvary”, also referred to as Golgotha is the northernmost part of the mount Moriah mentioned in the Bible and that the Garden Tomb is in the vicinity of this site. Tradition has it that this place was formerly a place of execution, where Jeremiah and Stephen were stoned and probably where Jesus was crucified. The discovery in 1882 of the 5th century Church of St. Stephen is offered as proof of the saint’s martyrdom here. Besides this excavations have shown that the Garden Tomb was indeed located in an ancient fruit garden bearing out the claim that Jesus was buried in a tomb located in a garden. Probably more pertinent are the architectural and layout differences between Iron Age burial caves and burial caves of the Second Temple period. While Iron Age burial caves have two adjoining chambers one beside the other, Second Temple caves have the two rooms aligned one behind the other. Another characteristic of Second Temple burial caves are distinct marks made by the use of comb chisels which had toothed edges. There is no evidence of the use of comb chisels in the Garden Tomb. Deacon Nonnus Onesimus, a monk of the Church of St. Stephen, was also the deacon of the Church of the Holy Sepulcher, which during the Byzantine period was known as the Church of the Holy Resurrection held the second highest position in the hierarchy of the Jerusalem church. It was because of the high position that he held, he was given the distinction of a private tomb in the vicinity of the Church of St. Stephen. So now we have two serious contenders for the tomb of Jesus: the tomb within the Church of the Holy Sepulcher and the Garden Tomb. The third contender is the Talpiot tomb. Which of the three if any of them actually is – is the real tomb of Jesus? (1) Miller, Kathleen E., Murphy, Sara., Feldman, Steven & Laden, Susan. (2007). The Burial of Jesus. Biblical Archaeology Society, Washington, DC. Burial Of Jesus – Was It In The Holy Sepulcher? While there is overwhelming support for the claim that Jesus was buried in the tomb of Joseph of Arimathea, but there is hardly any consensus about the location of this tomb. The two principal contenders for the final resting place of Jesus have been the Garden Tomb which is just outside the Holy City and the other is the tomb located inside the Church of the Holy Sepulcher built by Emperor Constantine at the behest of his mother Helena and is located inside the walls of the Holy City. Was The Burial Of Jesus In The Church Of The Holy Sepulcher? Does The Holy Sepulcher Enclose Golgotha The Hillock Atop Which Jesus Was Crucified? The name Golgotha has not been recorded in antiquity either in Jewish or non-Jewish sources. The best piece of evidence that the tomb of Jesus was in this area is the fact that other first-century tombs are still preserved inside the church. Called the “Tomb of Joseph of Arimathea,” these burial shafts (kokhim) are clearly from the time of Christ’s death and thus attest to some kind of burial ground in the area. Combined with the evidence from tradition, this church is probably the location of the Christ’s death and burial. Although it cannot be said with certainty that this is the burial spot of Jesus, it is a serious contender for that distinction. Was The Tomb In The Holy Sepulcher A Temporary One? Was The Burial Of Jesus A Typical Temporary Burial Practiced During That Period? (1) Holzapfel, Richard Neitzel., Chadwick, Jeffrey R., Judd Jr., Frank F., & Wayment, Thomas A.. (2008). Jesus and the Ossuaries: First-Century Jewish Burial Practices and the Lost Tomb of Jesus. 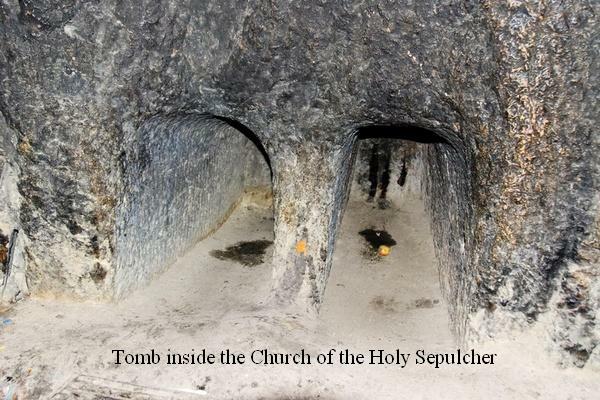 Retrieved 2011, from http://rsc.byu.edu/archived/%E2%80%9Cbehold-lamb-god%E2%80%9D-easter-celebration/12-jesus-and-ossuaries-first-century-jewish-burial-pra. (2) Gibson, Shimon. (2009) The Final Days of Jesus, The Archaeological Evidence, HarperCollins Publishers Inc. New York. (13) Miller, Kathleen E., Murphy, Sara., Feldman, Steven & Laden, Susan. (2007). The Burial of Jesus. Biblical Archaeology Society, Washington, DC. (14) Miller, Kathleen E., Murphy, Sara., Feldman, Steven & Laden, Susan. (2007). The Burial of Jesus. Biblical Archaeology Society, Washington, DC. After Pilate gave Joseph of Arimathea permission for the burial of Jesus, he together with Nicodemus, another important member of the Sanhedrin, and Abenadar a centurion began to take down the body from the cross. There is information in the New Testament apocrypha that Nicodemus, a ruler of the Jews, testified in favor of Jesus during the trial and angered the accusers (1). Abenadar was responsible for drawing the huge nails that were driven through the feet of Jesus. Joseph of Arimathea and Nicodemus held the upper body of Jesus with the same care as one would a badly wounded dear friend. The tenderness that the two showed would make one wonder if these two were afraid that they would cause Jesus more pain. According to some sources Joseph of Arimathea went about lowering the body of Jesus after he had obtained permission from Mary his mother. According to Mark 15:42–46, after bringing down the body of Jesus, Joseph of Arimathea took it to a place with water, presumably within his residence which was located just beyond the city walls. According to some sources the family tomb of Joseph of Arimathea was quite close to the cross and it would have been possible for Joseph of Arimathea to carry the body of Jesus all by himself, in spite of being past middle age. There they washed the body and anointed it with myrrh and aloe. According to (Acts 9:37), it is imperative that the body of a deceased is first washed before it is anointed and wrapped in linen. There is no reason to believe that Joseph of Arimathea and Nicodemus would not have done this. After that they wrapped the body in a sheet and laid it on the burial bench in a rock-cut tomb. He then rolled a stone across the doorway. Mary Magdalene and Mary the mother of Joses were present during the entombment (2). Matthew 27:57-60 endorses Joseph of Arimathea’s involvement in the burial of Jesus. Based on the accounts of the Gospels, Joseph of Arimathea is reported to have wrapped the body of Jesus in a linen burial cloth (sindon), known in Hebrew as a takrik and in the rabbinic sources as a sadin. According to the Gospel of Peter (6:24) the body of Jesus was first washed before it was wrapped in burial linen. It was the Jewish custom to prop the body of the deceased and then wash it, making sure that the impurities from the feet do not reach the other parts of the body. It was only after this that the body was anointed with oils and perfumes and wrapped in burial linen (3). Jews don’t embalm their dead. Instead they anoint them. It is for this that Nicodemus brought 75 pounds of myrrh and aloe to anoint the body of Jesus and treat the linen burial cloth, to counter the smell of death. Some believe that myrrh and aloe were dry aromatics that would help dry any fluids still oozing from the body of Jesus. Anointing the body and treating the burial cloth must have been done outside the tomb as it would have been impossible to carry out these tricky procedures with the confines of a dark tomb. It is quite likely that by the time the body was placed within the tomb it must have already turned dark (4). Joseph of Arimathea had to complete the burial of Jesus before sundown on Friday to comply with Jewish tradition. Since there was no time to get a grave ready before the beginning of the Sabbath, Joseph of Arimathea offered to entomb the body of Jesus in an unused rock-cut tomb that he had got ready for his own family. All the Synoptic Gospels are in support of what is said about the entombment of Jesus’ body in the family tomb of Joseph of Arimathea a wealthy man (5). This is in fulfillment of the prophecy of Isaiah who had predicted that the messiah would be buried in the tomb of a rich man. (Isa. 53:9). Not everyone agrees that the stone covering the mouth of the tomb was a round blocking stone. (See fig. 8). Of the hundreds of tombs that were uncovered only a handful of them had a round blocking stone. And these were found at the more sophisticated tombs that had at least two rooms or as in the case of one, a spacious hall. These tombs belonged to people who were rich and famous, such as Herod. Round blocking stones in such tombs as the one in which Jesus was buried were unheard of. The tomb of Jesus must have been of the regular type and would have had a square chunk of stone that served as a plug that blocked the entrance. Such a stone was called a golal. the only major ancient tomb located west of the Old City of Jerusalem. In the case of square blocking stone the wider end of the stone remained outside the tomb, while the narrower face fit snugly into the tomb’s entryway. According to some sources Pilate rebuffed the Jewish leaders. But according to others he accommodated them. It is not certain exactly how Pilate responded. When it was found that the tomb of Jesus was empty, according to Matthew, the guards report the incident to Pilate. This would make the guards Roman. But according to Peter, the guards report the empty tomb to the chief priest. This would indicate that the guards were Jewish. If in fact the guards were Roman, they would have been executed for dereliction of duty. And as there is no report of such an eventuality, it would appear that the guards were Jewish (6). This brings us to the question as to the number of guards that were posted to watch the tomb of Jesus. From a reading of Matthew 28 it is clear that there were more than two guards. Matthew 28 tells us that “some of the guards went into the city and reported to the chief priests [what] had happened.” If what Matthew says is correct then there would have been a minimum of four guards in all. It must be mentioned that of the evangelists only Matthew records the posting of guards to watch the tomb of Jesus. The other story relating to guards at the tomb of Jesus is by Peter. It can be safely said that the two stories are independent of each other as the language of the two are entirely different from each other (7). (1) Joseph of Arimathea. (n.d.). Retrieved 2011, from http://www.lundyisleofavalon.co.uk/godsetc/joseph.htm. (2) New Testament, An American Translation. (2011). Retrieved 2011, from http://www.ccel.org/ccel/bible/gdsp.Mark.15.html. (5) Gibson, Shimon. (2009) The Final Days of Jesus, The Archaeological Evidence, HarperCollins Publishers Inc. New York. A rich man named Joseph of Arimathea met the Roman prefect Pilate on the eve on which Jesus was crucified to request the Prefect for the body of Jesus. Joseph of Arimathea knew that he had to hurry and complete the Burial of Jesus before the Sabbath that would begin on Friday night. But he knew that he would be taking a great risk. It was difficult to say how Pilate would react as he was already upset with the Jewish leaders as they had threatened to report him to Caesar if he refused to crucify Jesus. Besides Joseph of Arimathea was a member of the Sanhedrin, the very body that wanted Jesus dead. So what was Joseph of Arimathea’s interest in burying Jesus? 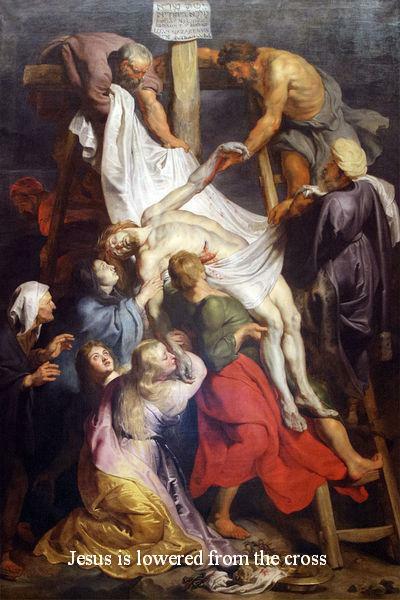 Furthermore bodies of victims of crucifixion were generally handed to members of the victim’s family. And Joseph of Arimathea was not a member of Jesus’ family. However Jewish leaders too were anxious to complete the Burial of Jesus for the same reason. As for Pilate, even though he would have liked to let the body of Jesus hang from the cross longer acceded to Jewish sentiments and did not want to offend the Jews fearing adverse consequences. As opposed as he may have been, Pilate consented to Joseph of Arimathea’s request. According to some sources Pilate should not have had any hesitation in giving the body of Jesus as both Roman and Jewish laws required that the next of kin dispose of the body of a deceased immaterial of the manner of death. The hitch here was that Joseph of Arimathea was not a close relative. We are told that at first on hearing Joseph of Arimathea’s request, Pilate was surprised that Jesus should have died so soon. Normally victims of crucifixion hung on the cross for many hours and in some cases for days before they died. Pilate did not believe that Jesus was dead. So he sent a centurion to verify that Jesus was no more. In those days the checks to verify that a person was dead was not the least bit refined. So probably the centurion decided that Jesus was dead through a visual inspection. Although it was the Romans that handed down crucifixion as capital punishment, the Jews did not hesitate to bury crucified bodies in accordance with Jewish law: “Nay, they proceeded to that degree of impiety, as to cast away their bodies without burial, although the Jews used to take so much care of the burial of men, that they took down those that were condemned and crucified, and buried them before the going down of the sun” (Jewish War 4.5.2), and within 24 hours of death in order to preserve ritual purity. In fact there was nothing in the Mishnah that prevented Jews from burying crucified relatives together with others of their family (2). This tradition is reinforced by John 19:31 “The bodies should not remain upon the cross on the Sabbath day (for that Sabbath was an high day).” The Jewish leaders were very specific regarding this, as this was no ordinary Sabbath that was approaching; it was the Passover Sabbath. This is what John was explaining when he described it as “an high day”. Besides this, Friday was the day of preparation for the Jews and the leaders probably wanted to rush through the Burial of Jesus and go about their business of getting ready for the next day. The Greek word paraskeue means preparation. It was called the day of preparation because Exodus 16:23-30 taught people to keep holy the Sabbath. That meant that even the food they require for the Sabbath had to be prepared the day before. Even when God provided the Jews manna from heaven, they had to gather what they would need on the day of the Sabbath, the day before (3). The tradition of burying the dead on the day of their demise was handed down from before the time of Moses who warned that if this tradition was not followed “their enemies will slay them and their unburied bodies will be food for birds and animals” (Deut 28:25–26). It probably had its foundation in the Mosaic law: “And if a man has committed a crime punishable by death and he is put to death, and you hang him on a tree, his body shall not remain all night upon the tree, but you shall bury him the same day, for a hanged man is accursed by God; you shall not defile your land which the Lord your God gives you for an inheritance” (Deut 21:22–23) (4). However history shows that this rule was sometimes not followed. But this being the Passover Sabbath they did not dare flout the rule (5). Josephus explains that it was also an ethical requirement : “We must furnish fire, water, food to all who ask for them, point out the road, not leave a corpse unburied [a1tafon], show consideration even to declared enemies” (Against Apion 2.29 §211; cf. 2.26 §205). Josephus notes that even the Romans rarely flouted this requirement in peacetime Jewish Palestine (6). The Romans used crucifixion to punish defiant Jewish leaders and let the bodies hang sometimes for days as a warning to others. However, such cases were rare (7). In fact Jewish customs were safeguarded by kings and emperors “throughout all the preceding ages”. Roman law makes concessions in this regard. It states that the bodies of those who are condemned to death should be given to the relatives for burial. There were however exceptions. In the case of persons condemned to death for high treason Roman authorities refused the relatives the bodies (8). In the case of those condemned to death for sedition the bodies were left to the vultures adding disgrace and dishonor to the death penalty. In some cases instead of allowing the bodies of those condemned to death to be buried in family tombs, the Jewish authorities provided a burial site beyond the city (9). In the case of Jesus, he was condemned to death under Roman law and the Sanhedrin had nothing against burying the bodies of such victims together with members of their family. As such there was nothing in Jesus’ case that “precluded a proper Jewish burial”. However victims of the death penalty for violation of Jewish laws were not permitted to be buried in family graves. “And they did not bury [the felon] in the burial grounds of his ancestors. But there were two graveyards made ready for the use of the court, one for those who were beheaded or strangled, and one for those who were stoned or burned” (Mishnah Sanhedrin 6:5) (10). 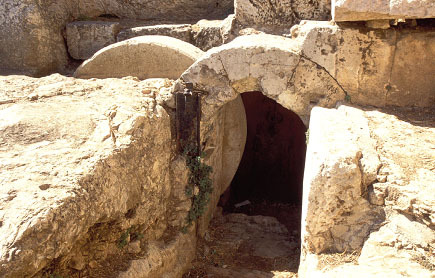 During Jesus’ time burial involved a primary burial and a secondary burial. Primary burial involved laying shrouded corpses on a rock shelf inside the tomb for about a year. There was an initial mourning period of seven days called shiva. This initial mourning period was followed by a secondary thirty-day period of less intense mourning called shloshim. However the mourning continued until the body was fully decomposed – usually a period of about a year. 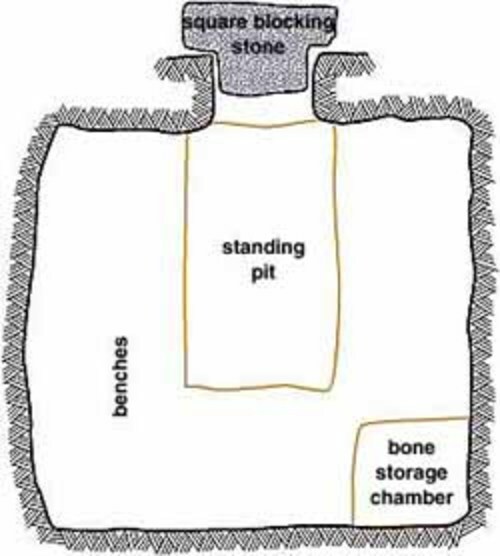 According to the Jerusalem Talmud: “When the flesh had wasted away, the bones were collected and placed in chests (ossuaries)”. On that day (the son) mourned, but the following day he was glad, because his forebears rested from judgment (Moed Qatan 1:5).” According to Tractate Semahot (“Mourning”) it says: “Rabbi Eleazer bar Zadok said: ‘Thus spoke father at the time of his death: “My son, bury me at first in a fosse. In the course of time, collect my bones and put them in an ossuary; but do not gather them with your own hands.” The practice of collecting the bones and placing them in ossuaries was called ossilegium (11). The probable reason for the secondary burial was the belief that with the degeneration of a deceased’s flesh sins were also removed and the individual would become eligible for resurrection (Romans 7:24). The practice was thought to have commenced after the Jewish people were conquered and felt that a secondary burial absolved them of their sins. This practice is believed to have continued until the next Jewish uprising and their destruction by the Romans in 70 CE. Even though the practice may have continued after that period, it was believed to have been observed by a significantly smaller percentage of the population until finally the practice itself lost its importance. One other reason for a secondary burial was conservation of space. However this reasoning is faulty as coffins have larger storage capacity than ossuaries. The other argument that secondary burial aided resurrection is also not sound since during secondary burial it was quite possible for some bones to be lost or scattered. Jews entombed their dead during the time of Jesus. These tombs were cut into the limestone that was commonly found around the city. This practice was prevalent when the Jews enjoyed autonomy or even partial autonomy. But for a few exceptions all such burial tombs were located outside the city walls. The entrances to these tombs were usually square to rectangular. Two types of recesses were carved into the walls of these tombs to hold individual corpses. One type was about 6 feet deep and about 1.5 feet wide and high. They were called loculi – kochim in Hebrew. The other type was the shallow shelf-like recess that was about 6 feet long. If the top of this shallow recess was arched it was called an arcosolia and if it had a straight top it was called a quadrosolia. At one time it was thought that such tombs were used by Jerusalem’s wealthy and that poorer Jews used trench graves. According to Shimon Gibson, in theory many cemeteries with trench graves may have been in use in the distant outskirts of Jerusalem. In fact a cemetery with trench graves was found at Beit Safafa a few kilometers south of Jerusalem. However this is the only instance of a cemetery with trench graves. The uniqueness of this cemetery is that it resembled the cemetery used by the sect that lived in the Qumran region on the northwestern shore of the Dead Sea. This resemblance prompted the Israeli excavator Boaz Zissu to suggest that the cemetery at Beit Safafa could have been used by the Essenes (12). Shimon Gibson contends that to say that the rock-cut tombs of Jerusalem belonged to its middle class is incorrect. Since there is no evidence of any cemeteries with trench graves it may be concluded that rock-cut tombs were the order of the day used generally by all or most of the Jews in Jerusalem. Gibson argues that the poor of Jerusalem were not as poor as some people have supposed. It is reasonable to conclude that the Jews of Jerusalem were relatively well off when compared to the standards of most other villages in Judea (13). Jerusalem probably owed its economic well being to the presence of the Temple which made it a place of worship and pilgrimage. It was obvious that Jerusalem became wealthy from the time of Herod until its destruction by Titus in 70 CE. Hence the argument that Jesus belonged to a poor family and could therefore not afford a rock-cut tomb is not correct. Beside if his friend Lazarus of Bethany could afford a rock-cut tomb, so too could Jesus (14). In addition to Joseph of Arimathea and Nicodemus the other people present during the entombment of Jesus are “Mary Magdalene and Mary the mother of Joses” Matthew 27:56-61. It will be of interest to note that Mary the mother of Jesus was not present. Mary the mother of Jesus was conspicuous by her absence. Presumably Joseph of Arimathea had asked John the beloved disciple to take her away not wanting her to suffer more than she already had. (4), (5), (6) & (8) Evans, Craig A.. (n.d.). Jewish Burial Traditions and the Resurrection of Jesus. Retrieved 2011, from http://www.craigaevans.com/Burial_Traditions.pdf.